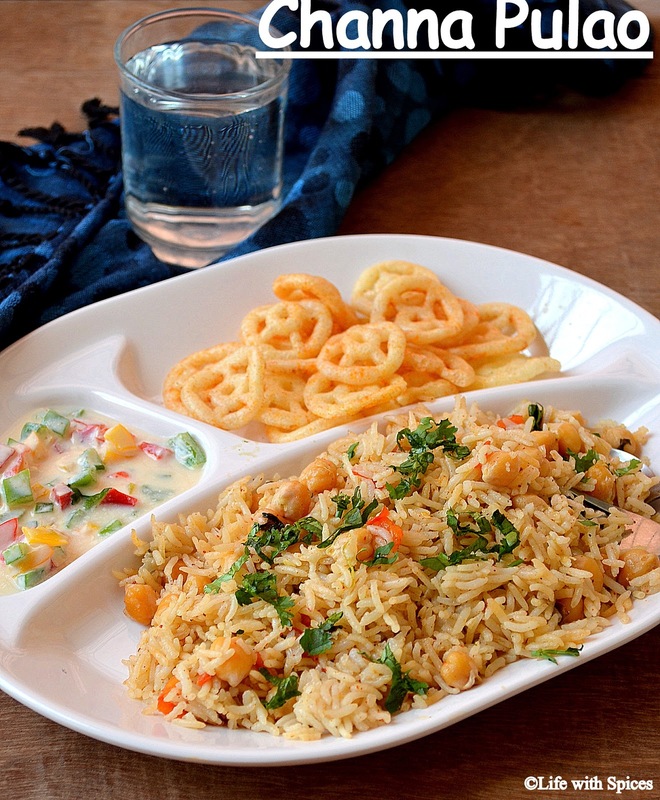 Channa Pulao a mild spiced pulao perfect to pack for lunch. A multi veggie raitha makes a perfect combo.. Protein and fiber rich channa makes a healthy n filling meal. What you need:Recipe inspired from Raks kitchen. Heat oil n ghee in a pressure pan add spices saute well then add onions n green chillies mix it add g n g paste and cook till raw smell goes and add tomatoes and cover and cook till soft. Add garam masala,salt ste well and add channa and 2 cup water and allow to boil. Once it starts to boil slow the flame and add drained rice and cover the lid. After 10 mins increase the flame and pressure cook for 3 hisses. Pack with some yummy raitha and fryums for lunch. I like your multicolour raita. it is inviting. Pulao looks cool. Healthy and tasty pilaf, the whole platter looks very tempting..
Thats raita is just catchy and this pulao makes me hungry..Inviting platter. Raita and channa pulao looks so colorful and inviting...lovely shot! One of my fav pulao.. looks delicious and inviting..
© www.lifewithspices.com 2017. Travel theme. Powered by Blogger.